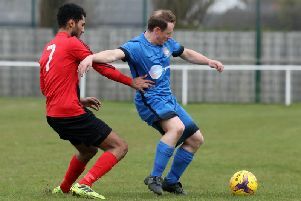 There is a big local derby on the cards in the ChromaSport United Counties League Premier Division this weekend. The weather had delayed Glyn Davies from taking charge of Desborough Town following the resignation of Chris Bradshaw nearly two weeks ago. But when Davies finally took control, he could only watch as his side suffered a 7-0 loss to promotion-chasing Newport Pagnell. And they will hope for better fortune when they entertain county rivals Wellingborough Town on tomorrow (Saturday). For their part, the Doughboys go into the clash on the back of a comfortable 4-0 success over Boston Town in midweek. Whitworth were also in action on Tuesday night as they were edged out 2-1 at home by title-chasing Wisbech Town. The Flourmen will hope to bounce back in another home game tomorrow when they entertain Kirby Muxloe at London Road. Rothwell Corinthians will be hoping a local derby can help them get their season back on track this weekend. Corinthians are without a win in 10 matches and take on Harborough Town at Sergeants Lawn. Irchester United picked up a fine victory on Wednesday night as they returned from Buckingham Town with a 4-3 success in Division One. The Romans will now be looking to follow that up when they welcome Huntingdon Town to Alfred Street this weekend. Stewarts & Lloyds face a tough test this weekend when they make the trip to take on promotion-chasing Potton United and, of the other local clubs in action, Rushden & Higham United entertain Bourne Town, Burton Park Wanderers face Buckingham at Latimer Park and Thrapston Town also have home advantage as they take on Lutterworth Athletic.